Apple is apparently planning to build three manufacturing facilities in the U.S., President Donald Trump has announced, though such facilities are most likely to be through a partnership with Foxconn or some other assembly company. Apple Chief Executive Tim Cook allegedly promised the president "three big plants —big, big, big," Trump said in an interview with The Wall Street Journal. Apple declined to comment on the matter, so little is known about where the plants will be located or what they will manufacture. 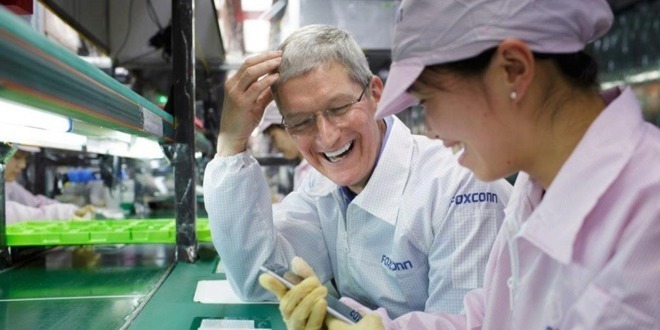 But considering that Apple hands off its assembly responsibilities to third parties, and the fact that Foxconn may announce its plans to bring plants to the U.S. as soon as this week, it's likely that Apple's plans are in partnership. Cook has long said that he would like for Apple products to be made in America, but doing so presents a number of issues, both financial and logistical. Some key parts for Apple products are made in the U.S., including A-series chips for the iPhone and iPad, but final assembly responsibility falls to tool and die makers overseas, particularly in China, as there are not many workers specialized in those skills stateside. Another Apple manufacturing partner, Pegatron, has also expressed interest in bringing assembly stateside. Still, it's unlikely that Apple's most popular product —the iPhone —would be assembled in America in large quantities, given that most component suppliers are located overseas. "To make iPhones, there will need to be a cluster of suppliers in the same place, which the U.S. does not have at the moment," Cook said in a December 2015 interview about a possible shift. "Even if Trump imposes a 45 percent tariff, it is still possible that manufacturers will decide to continue production overseas as long as the costs together with the tariffs are lower than the amount they need to spend on building and running production lines in the U.S."
Still, Apple announced the creation of a new $1 billion advanced manufacturing fund in the U.S. in May, intended to help stimulate job growth in its home country. The move came amid political pressure to repatriate jobs lost to overseas firms. Trump's administration has made job creation a major platform goal, and the president has repeatedly called on tech companies like Apple to produce their devices in the U.S. Note: Due to the political nature of this story, comments have been disabled. Readers are free to discuss this story in our Political Outsider forum.